One of my favorite things to do during the Holiday Season is decorate the Christmas tree! I've always had a real tree, so I plan to continue the "real tree" tradition with my children as well. I just love the smell of a real Christmas tree, and of course going and chopping down your own tree is always a fun adventure! As I've gotten older my preference for Christmas tree décor has evolved. Gone are the days that I would spread mass amounts of silver tinsel all over the tree...which happened to be my favorite part of decorating the tree as a child. 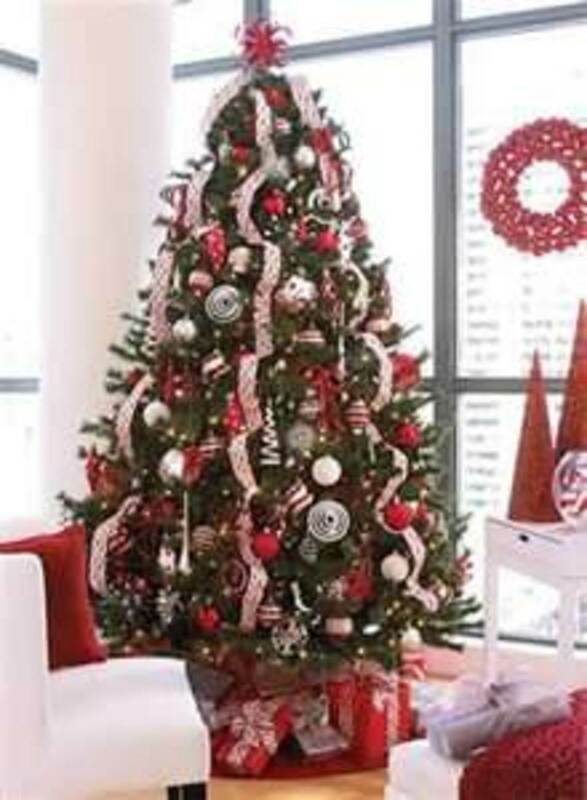 I've been doing a little research on different and unique ways to decorate a Christmas tree and I thought I'd share these ideas with all of you! One thing that has changed in how I decorate my Christmas tree is that I now use ribbon instead of traditional garland. I think that the ribbon just gives a more sophisticated look. I've noticed that they have actually started selling a wide variety of ribbons right in the Christmas tree decorating aisles. The good thing about ribbon is that you can get it in a variety of designs and textures, so you have a little more creative room than you would with garland. Another fun option would be to make decorative popcorn garland with the kiddos! I remember making popcorn garland for our Christmas tree when I was younger, and it was a really fun family activity. Beaded garland is another option that has been gaining popularity. I recently saw some wooden beaded garland at the store (after I had already decorated my tree) and thought that it would add a really unique touch to the tree! I really love the idea of using burlap as garland on the tree. It gives it a real country feel, which I'm a big fan of. 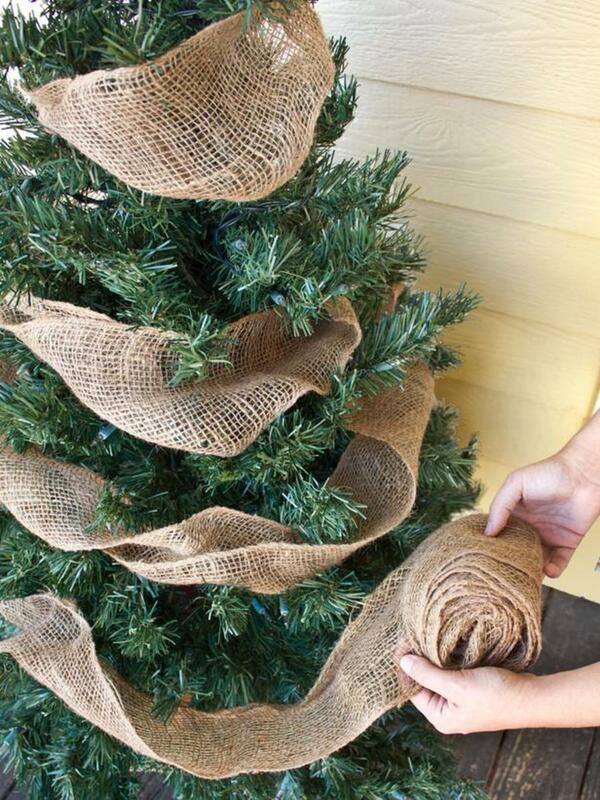 You could also decorate outdoor trees using this burlap garland idea and adding some simple white lights. I also came across the idea of adding some burlap bows onto your tree, which is another cute and creative way to add a little country feel to your Christmas tree. I've seen various sizes of burlap garland (ribbon) sold in the craft section at my local Walmart, but I'm sure you could probably find it at almost any craft store. This idea is pretty new to me, but makes perfect sense! Most people wrap garland around the tree, but why not try hanging the garland vertically from the top of the tree? What a unique idea! You can either tie off the garland at the top of the tree to a few branches (depending on the type of garland you are using) or you can use wire to attach the garland to the top of the tree to keep it in place. Try to weave the garland around the branches as it hangs down the tree to give it a little more character so that it's not sitting flat on the tree's surface. 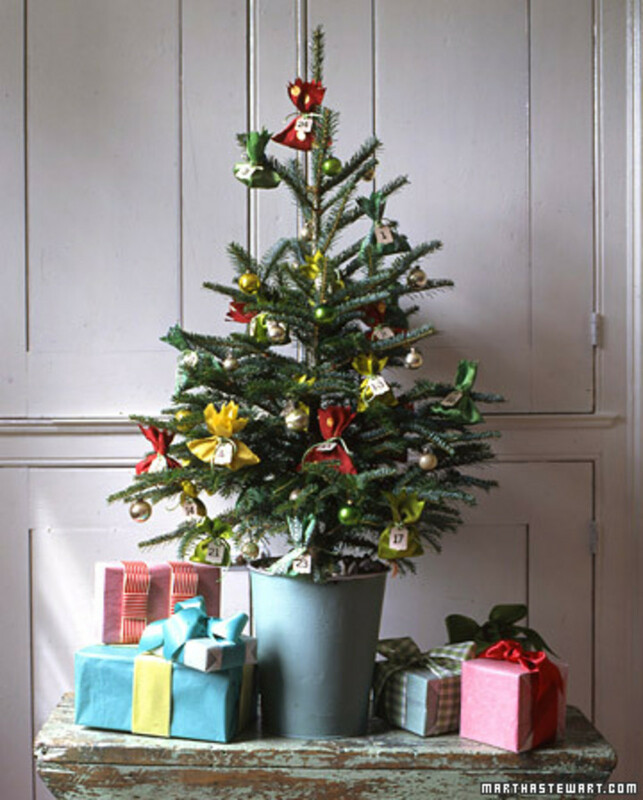 This method seems just as easy as wrapping the garland around the tree (maybe even easier!) For more general information and tips on hanging garland on a Christmas check out this article from eHow. Wow, take a look at this beauty of a tree! This tree makes a really bold statement, and there's nothing wrong with that. Obviously you could go with any colors you prefer, but I really like this hot pink and metallic combo. 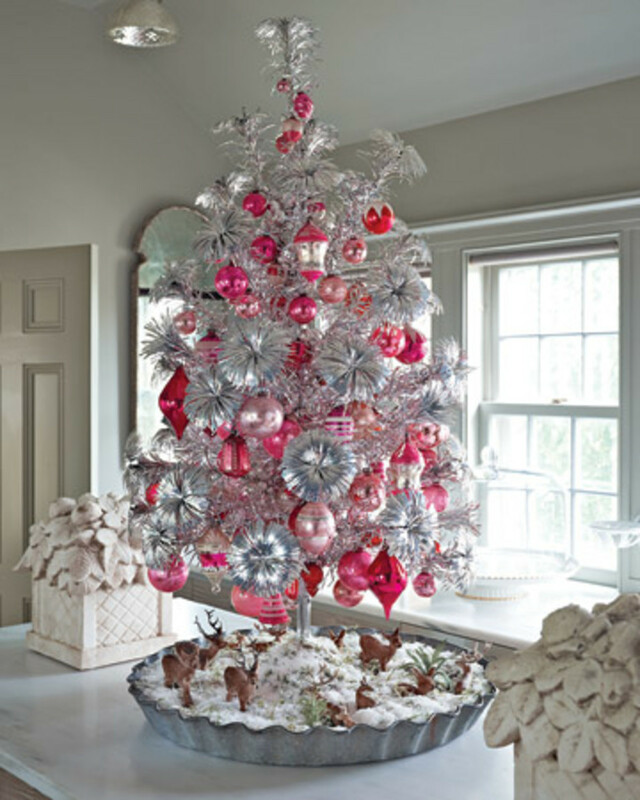 Unlike other artificial Christmas trees, this tree is actually made of strands of aluminum. This would be a great tree to leave up for New Years because it reminds me of all the sparkle and glitz of New Years Eve celebrations! This is a great idea! An actual advent Christmas tree that children can "undecorate" as the days pass. There is a number for each day leading up to Christmas starting December 1st. You can add the advent ornaments right in with your regular Christmas ornaments to keep the tree from getting too bare by Christmas. 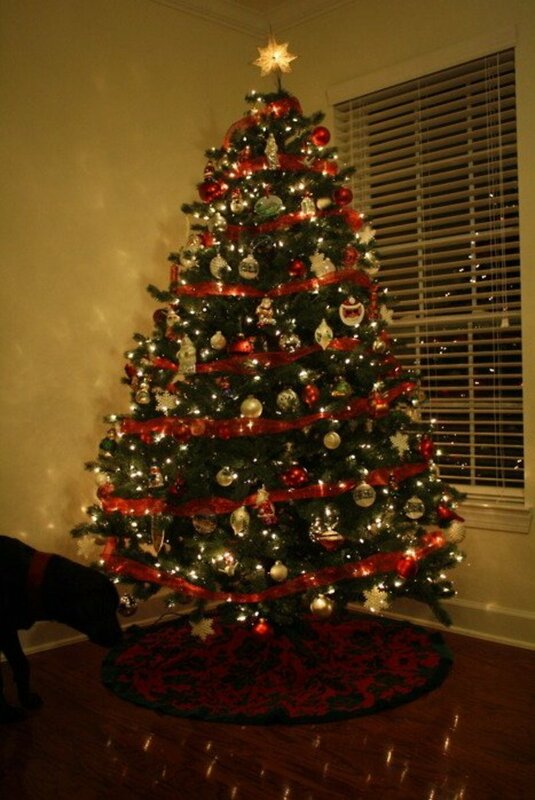 The pictures shows a smaller Christmas tree, but this idea would work great for a full-sized tree as well. The ornaments pictured are actually little numbered ribbon pouches. 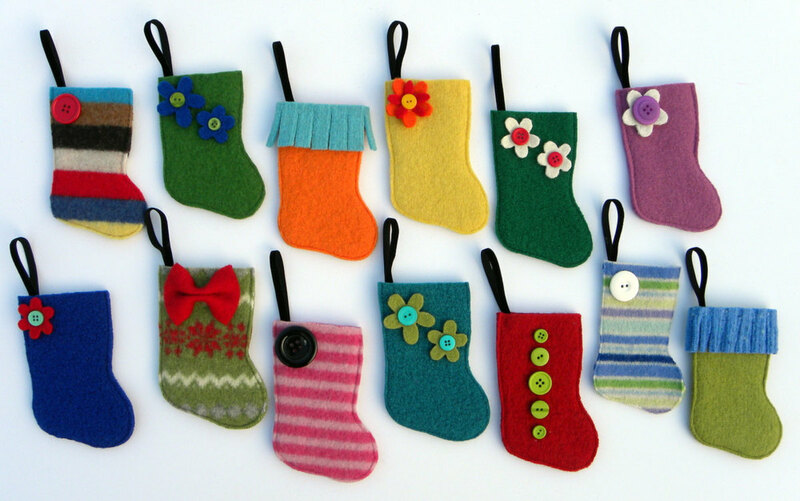 You could also try making your own little stocking ornaments out of felt (or some other crafting fabric) and just place a small piece of paper with the advent idea inside of the stocking ornament. Fill your advent ornaments with fun traditions or activities for the whole family to enjoy. It will really help build Christmas spirit and children will love being able to unwrap a new advent ornament each day leading up to Christmas. Click here for some great advent ideas. For all of you gardening enthusiasts out there, this would be the perfect tree trimming idea! 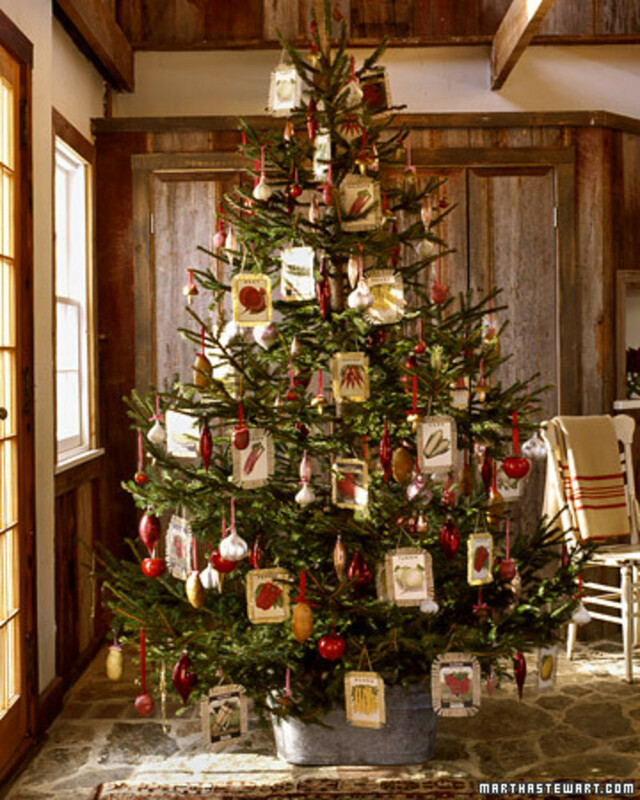 Take old or vintage garden seed packets and turn them into ornaments for your tree, what an easy and affordable way to incorporate the hobby of gardening into Christmas. Use burlap or ribbon to spruce up the old seed packets. Actually, the burlap garland idea would go wonderfully with these seed packet ornaments! Check out this tutorial from Martha Stewart on how to make seed packet ornaments from scratch with a few simple supplies. 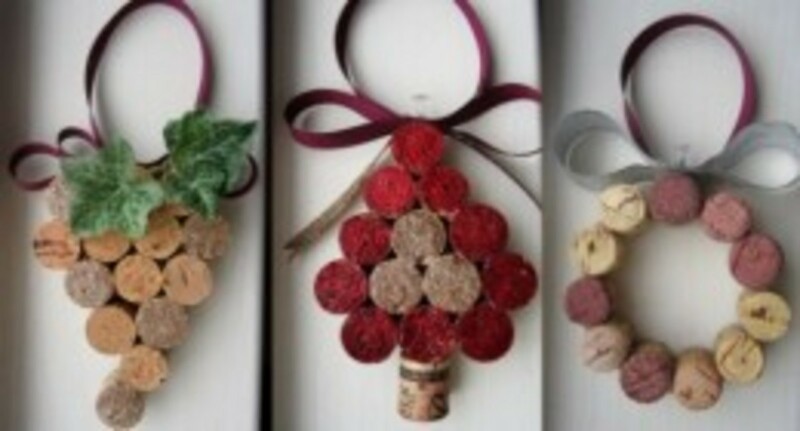 Oh, and homemade Christmas ornament making would be an excellent idea for your advent calendar! I absolutely love this idea. You simply take a wedding invitation, baby shower invitation, or any other special event invitation and cut it into small strips. Put all of the strips into a clear glass (or plastic) ornament. Add charms or other decorative accents to spruce it up. This is such a simple and easy DIY ornament, but it is so meaningful and special! 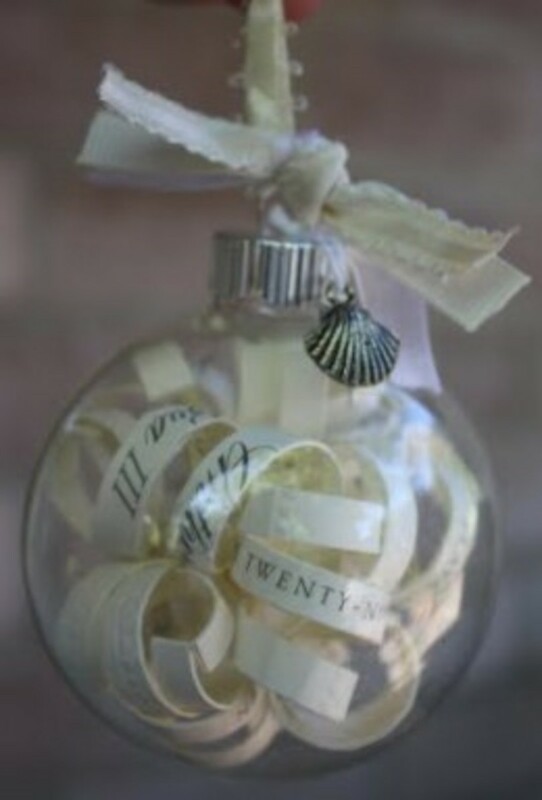 Another simple DIY ornament idea! You just glue them together and then personalize with ribbon or other decorative touches. You can also paint or write on the corks (with permanent marker) to add dates, initials, or words that may be meaningful. If you're not a big wine drinker let your friends and family know ahead of time that you need their old wine corks, most people just throw them out anyhow. You can also find them online and buy them in bulk through Amazon. 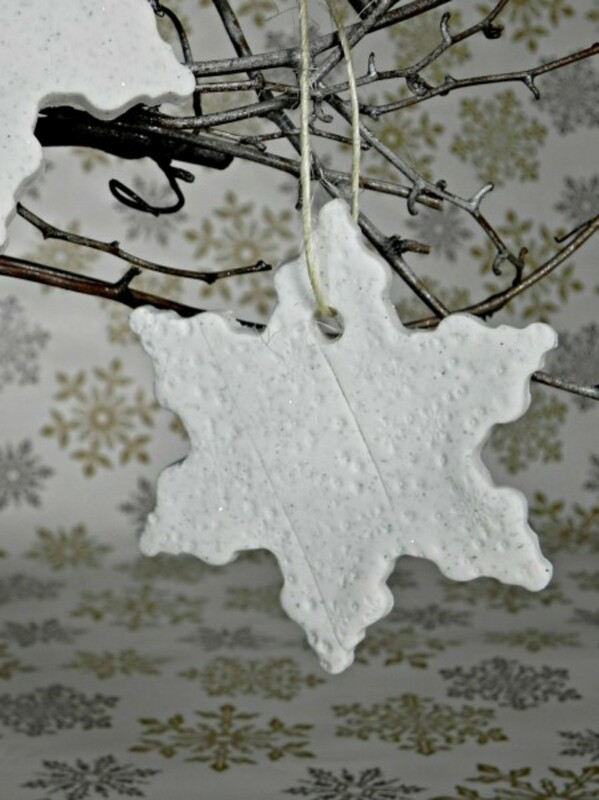 This is another easy DIY Christmas ornament idea. I actually made a batch of these to give out as Christmas gifts. It was so easy, and I just know that kids will love this little project. For the complete tutorial on how to make these fun little homemade ornaments and the supplies that you will need, click here. Great ideas. I love the variety of options on how to decorate your tree. I haven't done mine yet. I might consider it. Thanks for sharing. Personalized ornaments are the take away for me. Storing your memories in a Christmas decor is really great. I watched your February 27, 2012 Sermon at Liberty. I want to be an elvngeaist! Lord willing I will complete my MAR at Liberty this Fall. I am also a Marine.Can you help me learn how to be an elvngeaist? Dear Bro. Lee- I was at the C.O.R.E. Conference in 1989 in Garland. I have gone to Pastor's Schools and Conferences for over 40 years- THAT was the greatest one EVER! I was wornndieg if you had VIDEO/DVD of Leonard Ravenhill when he spoke on Monday night. I have the cassette tape, but would like to use it on my telecast that goes out to 48 stations across the USA. Please let me know. God bless you is my prayer! @kidscrafts- Thanks for the kind words, glad you enjoyed the article! I also have some really meaningful ornamnets that I hang on the tree every year, and each year we add another ornament that has a special meaning to our family. I think next year I will also add advent ornaments and give that a try! 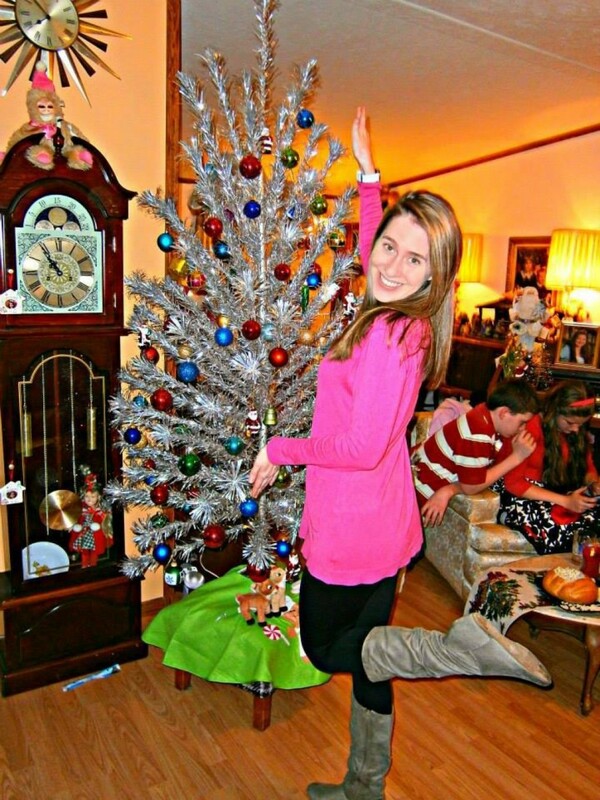 I love your Christmas tree article! So many styles, so many possibilities to decorate a tree. At home, I know that I am not original because I always use the same ornaments year after year; I suppose that in that case the signification of each ornament is what is important. But I participated to two contests or Christmas tree decoration for the Children Hospital ... and I loved to create my own decorations for those trees. So I can really appreciate everything you show in your article! I super love the mini stockings for the Advent!